This summer we called on drum corps fans to "spread the word" about drum corps to the uninitiated - invited longtime fans to become marching music evangelists. Kevin Smith and Steve Tant of the Carolina Crown sent in this one. "The local detachment of the North Carolina Marine Corps League has provided new volunteers for Nightbeat for the past five years. Along with the MCL staff, "new converts" are recruited every year. Their mission of "Supporting America's Youth" fits right in with Carolina Crown and the entire drum corps community. 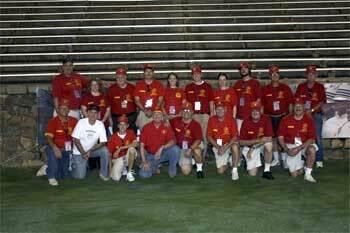 The CrownEvents committee is grateful for the volunteers provided by the Marine Corps League." Pictured in the front row: Jim Tant, John O'Reilly, Brendan Cagle, Bill McKenna, Roberto Cruz, Jim Brennan, Paul Juneau, Denny Mathias. In the back row: Jeff Douglas, Denise Douglas, Lee Shideler, Bobby Cagle, Adrienne Rose, Peter Austin, Erin Whittenburg, Nathanael Whittenburg, Frank Gettys, Larry Bradley. Thanks guys! We realize the summer is over, but if you brought a "new" drum corps friend to a DCI show this past summer, send us a pic and we'll acknowledge you! But then this winter, you've got to promise to keep those drum corps passions burning, and inspire your new converts to bring friends to DCI shows next summer!